The "Great Wall of India"
The 15th century Kumbhalgarh Fort in Rajasthan is one of the popular desert state's lesser-known historical masterpieces. Yet, it's of extraordinary significance. You may be surprised to discover that the mammoth wall of this UNESCO World Heritage Site is the second longest continuous wall in the world (after the iconic Great Wall of China), earning it the title of "Great Wall of India". What's not surprising is that Mughal invaders found it impossible to penetrate the fort. While Chittorgarh Fort served as the capital of the Rajput kingdom of Mewar, it was Kumbhalgarh that provided refuge for its rulers in times of attack. Find out more about Kumbhalgarh Fort and how to visit it in this complete guide. 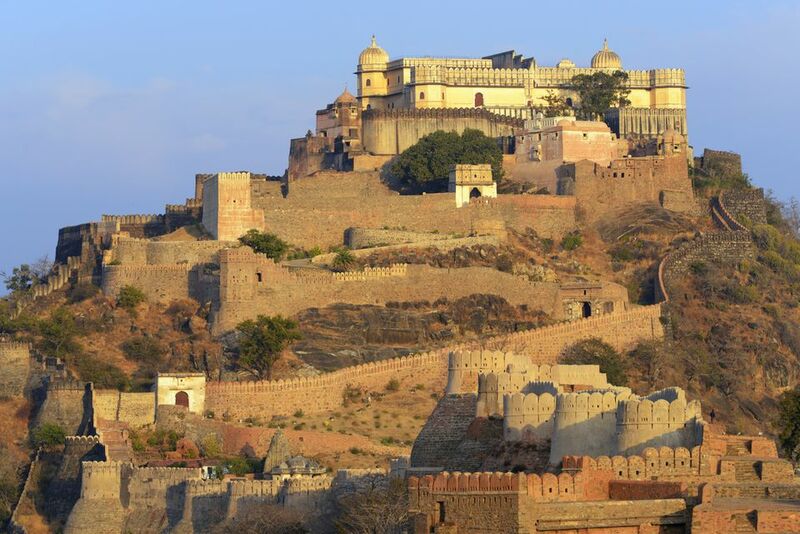 Kumbhalgarh is named after Mewar king Rana Kumbha, who built it from 1443 to 1458. During his reign, the king focused on fort planning and architecture. He and his architect, Mandan, are acclaimed for experimenting with and perfecting medieval Rajput fort design, adding many new innovations. Apparently, Rana Kumbha constructed or restored 32 forts — quite an achievement! This included strengthening the walls of Chittorgarh Fort. It's said that site of Kumbhalgarh Fort was originally settled by a Jain prince, Samprati, in the 2nd century BC. Its isolated and concealed position, atop a lofty hill surrounded by concentric hills and valleys, gave it a commanding view and strategic importance. Previous Mewar rulers were familiar with the site's potential. However, it was Rana Kumbha who harnessed it and meticulously developed it, by taking advantage of the terrain's natural contours. What's particularly ingeniousness about the fort's colossal wall is that it follows the contours instead of a straight path. The wall snakes for an astonishing 36 kilometers (22 miles) over 13 hills. Making such an extensive protective boundary around a fort hadn't been done before. What also sets Kumbhalgarh apart from many other forts in India is that it was conceived and constructed in a single phase. Unfortunately, Rana Kumbha was killed by his son Udai Singh I in 1468, not long after Kumbhalgarh was built. The fort lost its glory for many decades after that but was revived to play a key role in the Mewar kingdom's history. After Sultan Bahadur Shah of Gujarat besieged Chittorgarh Fort in 1535, the heir to the throne, Udai Singh II, was sent to Kumbhalgarh for safety. He was coronated inside the fort in 1540 and his son, heroic king and warrior Maharana Pratap (great great grandson of Rana Kumbha), was born there the same year. Udai Singh II went on to found Udaipur, before dying in 1572. Maharana Pratap spent much of his reign at war with powerful Mughal Emperor Akbar. Unlike neighboring Rajput rulers, he refused to give in to the Mughals. This resulted in the horrific battle of Haldi Ghati in 1576. Although the Mughals won, Maharana Pratap managed to escape. The Mughals continued to try and capture Kumbhalgarh but failed. To gain access, they had to resort to poisoning its water supply, in 1579. This enabled them to occupy the fort for a few years, until Maharana Pratap recovered it in the 1582 Battle of Dewair near Haldi Ghati. The Mewar king's victory was overturned in the 17th century though, when Rana Amar Singh I (Manarana Pratap's son) reluctantly gave up the fight and surrendered to Mughal Emperor Jehangir in 1615. Kumbhalgarh's importance waned from then on. Violent invasion of Marathas, from present-day Maharashtra, became the main threat in the 18th century after the decline of the Mughals. It wasn't until the early 19th century that the fort was finally returned to the Mewar kings, when Maharana Bhim Singh signed an alliance treaty with the British East India Company in 1818. During his reign from 1884 to 1930, Maharana Fateh Singh carried out restoration works at Kumbhalgarh. The visionary king was an avid builder. He added the Badal Mahal at the fort's highest point (he constructed the magnificent Shiv Niwas Palace Hotel, which is part of the City Palace complex in Udaipur, too). Following India's independence from the British, Kumbhalgarh became a protected monument under the auspices of the Archeological Survey of India. The fort is located within Kumbhalgarh Wildlife Sanctuary, just over two hours north of Udaipur in the Aravalli Hills of Rajasthan's Rajsamand district. It sits at the boundary of the erstwhile kingdoms of Mewar and Marwar (which ruled the region to the west around Jodhpur). Kumbhalgarh is commonly visited on a day trip or side trip from Udaipur. You can easily hire a car and driver from the multitude of travel agencies in Udaipur. Expect to pay anywhere from 2,800-3,600 rupees for a full day, depending on the vehicle type. If budget is a concern and you don't mind a longer (and somewhat inconvenient) journey, buses run every hour or so from Chetak Circle in Udaipur to Kelwara village near the fort. Travel time is about three hours and costs 50 rupees. Get off the bus at Kumbhalgarh Circle, a couple of kilometers (1.25 miles) before the fort, and take a jeep taxi from there. Local buses run between Kumbhalgarh Circle and Kelwara. The fort is officially open daily from 8 or 9 a.m. to 5 or 6 p.m., depending on the time of year. People actually live inside the fort though, so it's possible to remain in there! Entry tickets cost 40 rupees for Indians and 600 rupees for foreigners. There's no entry charge for children under 15 years of age. Plan to spend three to four hours exploring Kumbhalgarh Fort. There's quite a bit to see and some strenuous uphill walking is required, as vehicles aren't permitted to go inside (unlike Chittorgarh). The unforgettable view from the top of the fort makes the effort worth it, and the sheer size of the fort's exterior wall alone is simply awe-inspiring. Guides are available at the fort entrance and you can expect to pay 300-400 rupees for one, depending on your group size. Alternatively, you can wander through the fort by yourself if you're not interested in its detailed history. There are more than 360 temples scattered within the fort, most of which belong to Jain deities. You'll come across a cluster of temples after you go through the gargantuan main gate. From there, follow the paved path upwards through successive fortified pols (gates) to the fort's three palaces, at different levels. These are Kumbha Palace, Jhalia ka Malia (Palace of Queen Jhalia) where Maharana Pratap was born, and the topmost Badal Mahal. A building housing several canons is another highlight. The fort is particularly spectacular around sunset and just afterward, when its structures are evocatively illuminated. Those who want to learn more about the history of the fort may want to stay on for the evening sound and light show (offered in Hindi only). There's no fixed starting time. The show begins as soon as it's dark enough. This could be as early as 6 p.m. or as late as 7:30 p.m. It runs for about 45 minutes. Tickets cost 118 rupees for adults and 49 rupees for kids. You'll get a fabulous view of the fort and its exterior wall from the viewpoint about a kilometer (0.6 miles) before the main entrance. A zip-line runs across the valley to the fort wall as well. Feeling energetic? It's possible to walk along the wall, into the wilderness, starting out from the entrance gate (Ram Pol). Those who are particularly adventurous can hike the entire length of the wall. It takes two days. If you stay at Kumbhalgarh longer than a day, you'll be able to enjoy numerous nature trails and outdoor activities in the area. The Kumbhalgarh-Ranakpur trek through Kumbhalgarh Wildlife Sanctuary is a popular option. It's quite an easy downhill trek that's approximately four hours in duration. Take a local guide with you. Many people combine visiting Kumbhalgarh with Haldi Ghati, or the Jain temples at Ranakpur. Rajasthan Tourism organizes an annual three-day Kumbhalgarh festival at the fort from December 1-3 every year. It features music and dance performances by folk artists, puppet shows, fun traditional games, and a heritage walk. The Aodhi, owned by the Mewar royal family, is the most renowned hotel in the area. It's nestled into the jungle close to the fort, has an outdoor swimming pool and offers horse riding. Expect to pay about 6,000 rupees per night and up for a double room. Club Mahindra has a resort at Kumbhalgarh, which is ideal for families. If you're not a member, rates start from about 10,000 rupees per night during the tourist season. Breakfast is included. Fateh Safari Lodge, perched high in the hills, will appeal to outdoorsy travelers. It's a relatively new luxury property that opened in late 2014, and is part of the same group as the Fateh Garh hotel in Udaipur. Expect to pay upwards of 5,000 rupees per night for a double room. There are numerous other new luxury resorts in the area, with rates starting around 6,000 rupees per night. These include Via Lakhela Resort & Spa, The Wild Retreat, and Kumbhalgarh Safari Camp. Hotel Kumbhal Palace is the closest budget option to the fort, not far from The Aodhi. It has decent rooms and luxury tents priced from 2,500-3,500 rupees per night. Otherwise, head to Kelwara village for cheaper budget accommodations. Try New Ratan Deep Hotel or Karni Palace Hotel there.